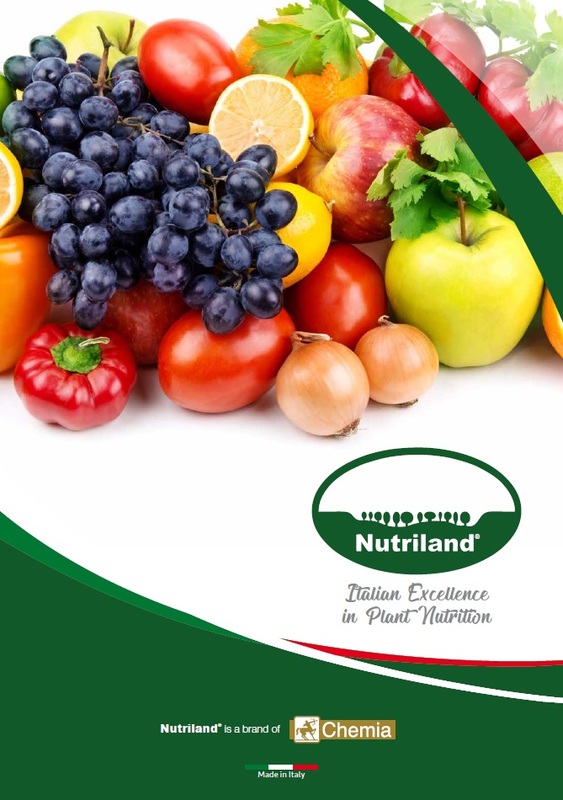 Developed from Chemia’s experience in plant nutrition, the NUTRILAND brand, with its range of focused products, is a core division of Chemia. Because of the different requirements of different crops and situations, it is essential to select the appropriate product and NUTRILAND products enable the cultivator to do just that. All NUTRILAND products undergo a thorough testing procedure, involving both field testing and rigorous quality control tests in the laboratory. The company adheres to quality standards ISO 9001 and ISO 14001. The range of fertilizers manufactured under the NUTRILAND brand includes a variety of liquids, minerals, powders and granules, including several treatments permissible in organic farming. Liquid and mineral solution fertilizers include both simple and compound treatments for foliar and radical application and fertigation through the irrigation system. They include several nitrogen-based fertilizers, together with treatments containing calcium, phosphorous and magnesium solutions, and fertilizers containing trace elements such as iron, boron, manganese, zinc and copper. Fertilizers are suitable for a range of crops and situations, including fruit, vines, beet, cereals, ornamentals, legumes, oilseed, vegetables, tobacco and forages, and also lawns, golf courses, forestry, meadows and pastures. Organic fertilizers derived from plant and animal materials include high proportions of biological carbon together with nitrogen and are recommended for a range of uses. They are available in various forms, including liquid, suspension and microgranular, for fertigation, foliar application and localised composting. The NUTRILAND range also include humics, soil conditioners to be used in conjunction with fertilizers to promote optimum soil conditions, in contrast to fertilizers which act primarily on the plant itself. Humics are available in both granular and liquid compositions. Other products include phytoregulators, seed treatments, mycorrhiza to improve soil ecology, and speciality formulations to promote plant defence and anti-stress mechanisms. Fertilizers and speciality products act on several plant processes, such as encouraging root development, vegetative growth, disease resistance, nutrient absorption, fruit preservation, and fruit and floral coloration. Chemia’s range of products for crop protection and nutrition is comprehensive and aimed designed to meet the challenges of various markets. Each product is designed with several factors in mind, including environmental impact and grower risk as well as efficacy. All stages of product formulation and manufacture are carried out to comply with safety directives and customer requirements. Chemia’s sales network, under the supervision of trained agronomists, can advise cultivators on the best products to use in specific situations.